Are your assays prone to false positive and false negative results? Is your assay development process slowing you down? When every sample, every second and every cent matter, SAMDI (Self-Assembled Monolayer Desorption Ionization) technology is your solution. Accelerate your drug discovery projects with data you can trust. SAMDI technology leads the industry with rapid, quantitative, label-free solutions for drug discovery research. 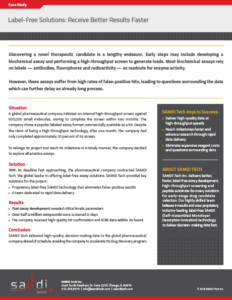 Learn how SAMDI Tech’s label-free solutions helped accelerate a drug discovery program by delivering high-quality, decision-making data ahead of schedule.